Would you like to know what are the most important factors while looking budgetary cordless drill in 2019! Which cordless drills under £100 are the best? Take a look at this list! 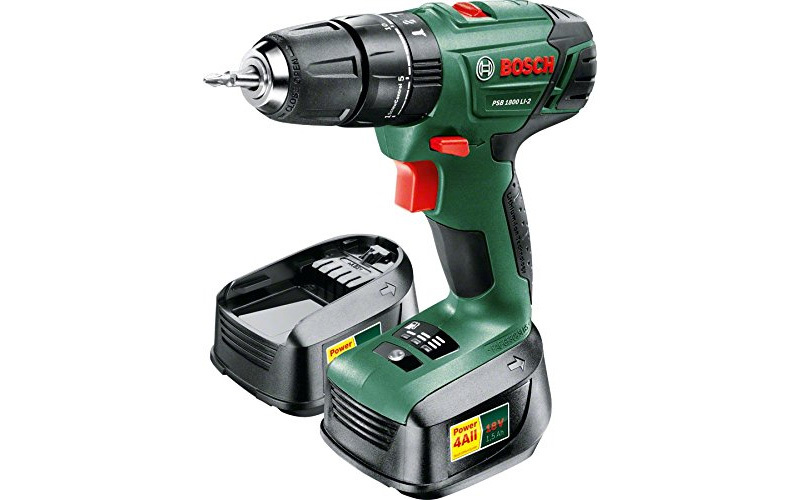 The suggestion number one is Bosch PSB 1800 LI-2 Cordless Combi Drill! 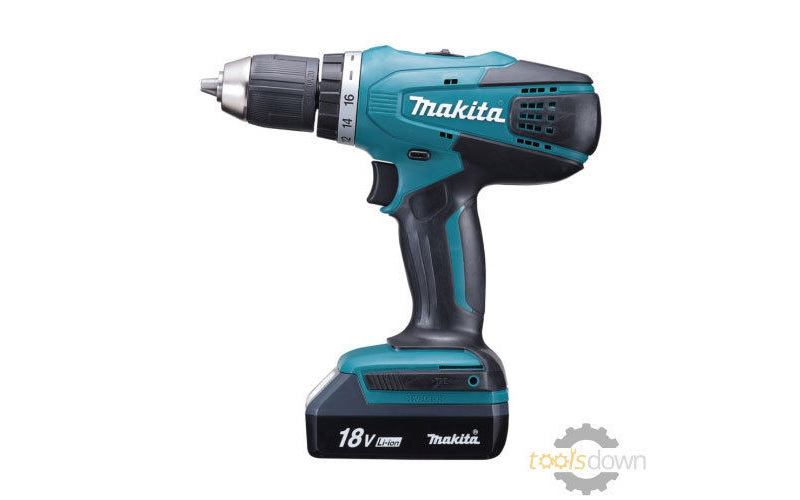 The recommendation number five is Makita 18 V Cordless Combi Drill! 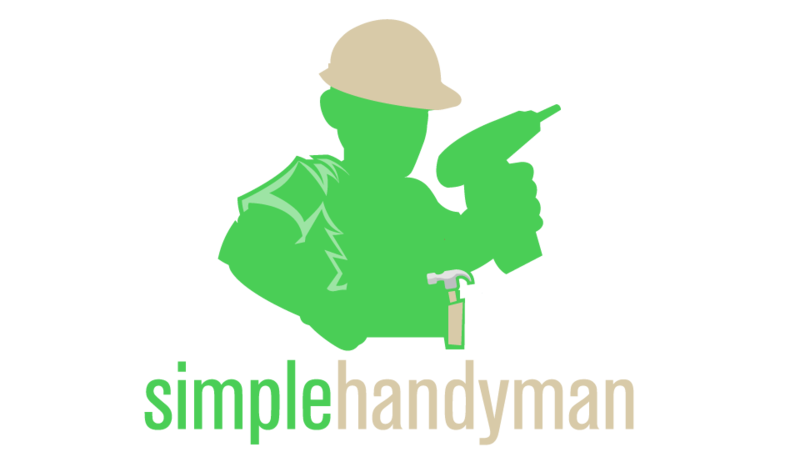 What to look for when thinking about cordless drill under £100? 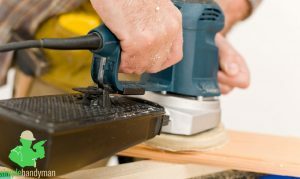 Ladies and gentlemen, today in this article we will deliver you answer on this particular question, showing you the most important elements and basics regarding cordless drills that cost no more than £100. 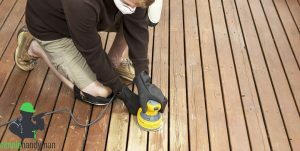 This list consists of the most important factors that need to be fulfilled if we really want to find legitimate cordless drill that can be used for more than a month or two. Please remember, that the following description will suggest how to find the tool that will fulfil your demands. It will not; however, point you the best and the only choice, because simply there are so many interesting productions it’s too difficult to indicate which one is the best. Each and every model characterizes with its positive and negative sides. However, to bring you closer the choice, we will start from presenting some examples of models that you might find attractive. If you looked at the suggestions regarding drills under 50, then you noticed a lot of drills without two batteries. Because of that, we were unable to work and at the same time charge our drill. In case of Bosch PSB 1800, this option is available. 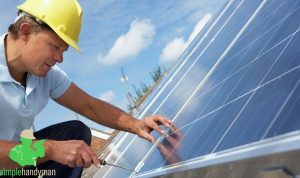 In addition to two Lithium-Ion batteries, which are well-known for their energy density. Of course, there are other elements regarding this Bosch model that makes this particularly interesting choice. It is of course, multi-choice of torque, where we received 20 positions, as well as additional drill and impact drill settings. A very pleasing element is the way the producers designed grip. It is soft and you can without any problems operate with only one hand. Of course, the weight is higher than in case of cheaper and smaller drills, but thanks to that the tool is more stable. Very high ratings, plenty of positive opinions, and rather low price, which little below £100 when it’s on sale – all of that makes this particular model very interesting and worth-noting choice. 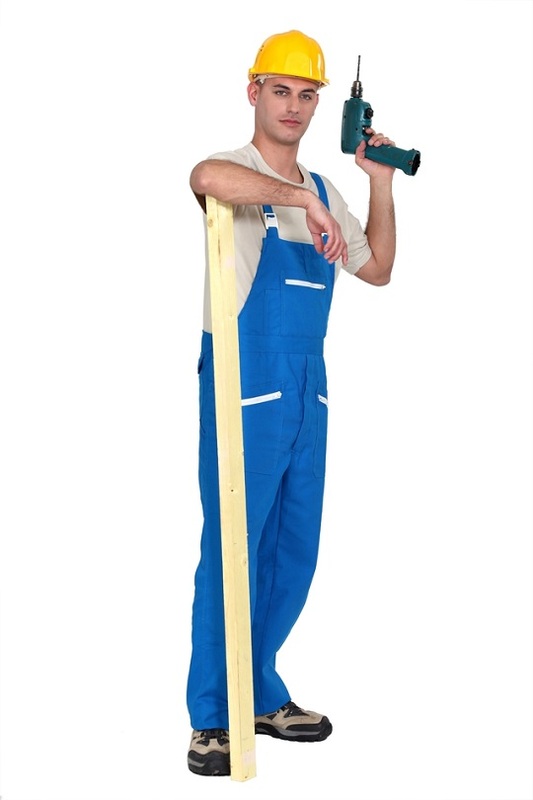 This product is the best described as multi-level, multi-functional tool with some extras. 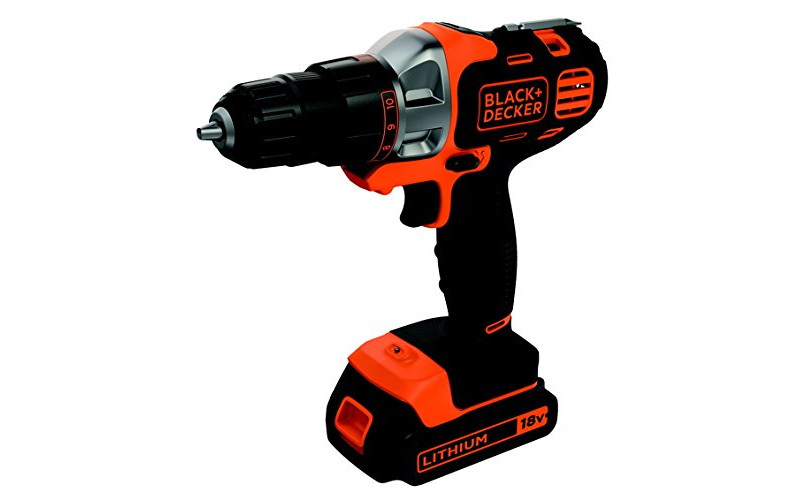 However, there are more interesting pros Black Decker can offer. We also receive here very rich additional equipment and accessories in the form of a bit set, sander attachment, or even extra battery. As for the drill itself, we receive here regular 18 V drill with the special function that lets us convert the power to be used for a variety of materials. Drill driver head can be adjusted for such materials as wood, metal, etc. Next to that, we should also focus our attention on 10 extra torque settings. It may not be as many positions as in case of Bosch, but it will surely satisfy some of us. There is even a special option called fingertip control, where we can adjust speed for all types of drilling or screw driving. Of course, there are some obvious downsides. One of them is the price. The drill itself can be purchased for below £100, but if we want to have access to all accessories, we need to prepare for the costs exceeding under £100 threshold. If you are looking for professional combi drill, then this set will be just enough for you. If we do not count all the accessories in the suggestion number two, then this is one of the most expensive drills in our list. It gives us only one battery, but thanks to very effective charger, we will be able to use DeWalt after an hour of charging. The battery installed in this model is of course made of li-ion. 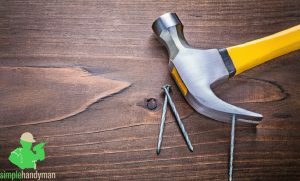 When it comes to functions, we can distinguish three options that can be used for effective work – drill, hammer drill, and screwdriver. Gearbox is 2 speed, so we have received even better torque versatility. Chuck is keyless, so we can use without any problems variety of drill bits that will suit its 13mm input. 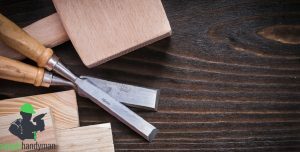 As for maximum drilling capacity, we will surely surprise you that you can drill 25 mm in wood, 13 mm in metal, and 13 mm in masonry. Another interesting fact is that the grip is covered with rubber, so it’s much more stable in one-handed use. The cost for this cordless drill is little below £100, one of the highest on our list. 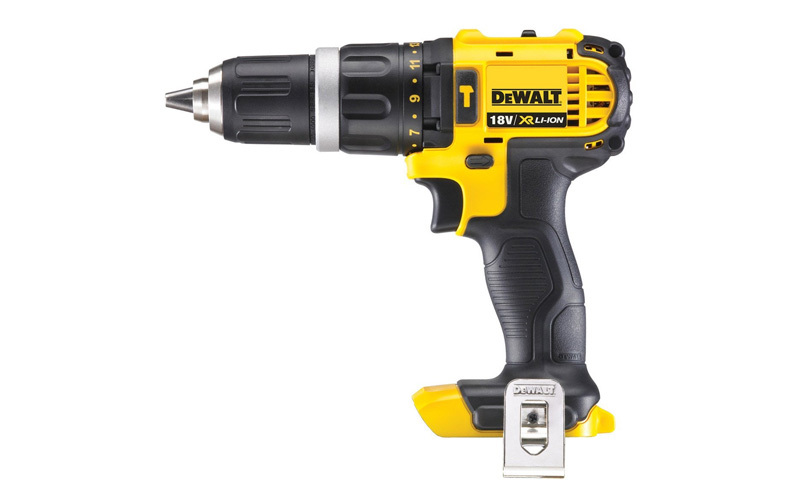 DeWalt 18V XR Lithium-Ion Body Only 2-Speed Combi Drill is unlike previously mentioned tools very light and it can without any troubles be used one-handed. Thanks to compact size and very attractive design, it can be used in confined spaces with no troubles. 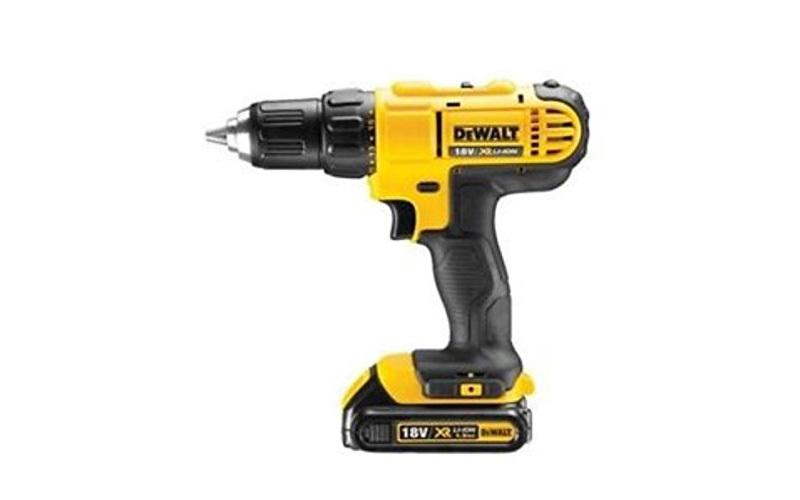 As in previous tools, DeWalt 18 V XR is delivered with Li-ion battery, which is standard technology in nowadays drills. While mentioning functions, we cannot forget about two-speed transmission, what lets us adjust the tool for the material, prolonging the life of the drill and making it even more effective. Adjustable function also concerns torque control, where we can also choose one out of 14 positions. The tool weighs 1.2 kg, what is almost three times less than other products. The producer also provides us with a guarantee for one year or three years (if we decide to register it online), so we have the legitimacy proof. The cost of this light, portable, and compact device with very decent power is exactly between £50 and £100. In this case, we also receive only one battery type Lithium-ion, but compared to previous tools, in here we receive lightness with great power. The torque is capable to drill at the maximum capacity of 36 mm when it comes to wood and 13 mm for metal and masonry. It is very good result when we take into account that the weight of Makita model is the only 1.7kg. As for other functions, we receive here three drilling modes (hammer combi drill, screwdriver, and rotary drill), 2-speed gearbox with variable speed, and 16 torque settings. It gives us the possibility to adjust the drilling power to a particular material. Another interesting function is automatic spindle lock and electric brake. The ergonomic design is finished with rubber grip, what increase the comfort and stability. The battery charger is capable of recharging our battery within 1 hour. The price we are going to pay for Makita is the highest of this all because it is exactly our limit. So, without any further ado, let us learn you some of tricks how to find a proper device. 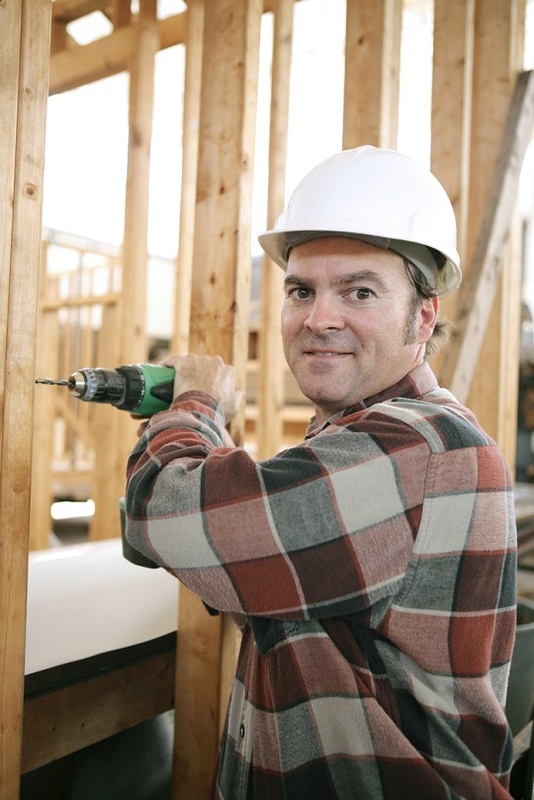 You probably think that the amount of space the drill takes or its weight isn’t important. That is the first mistake you could do while looking for cordless drill. Of course, this is not the most important element we will taking under consideration, but if we forget about weight and accurate stabilization, we will receive unhandy tool that has to be used two-handed that weighs too much and its grip is non-dynamic. First of all, we need to make sure that it’s compact, so we can use it effectively in any room. Now, if we care about one-handed performance, we should focus on tools with the weight not exceeding 2.5 kg. Also, take a look if the stability of the tool is on the right place. Three the most important parameters when it comes to performance of our tool. In the contrary to appearances, they are connected with each other and to be honest, we cannot achieve great torque without 2-speed gearbox, and we are not going to get adjustable speed if we cannot regulate torque. That is why next point is so important for torque and other tool specifications. Thanks to variable speed and the possibility to change speed with gearbox, we can prolong the lifespan of drill and make sure that we drill through the given material with appropriate speed and power. 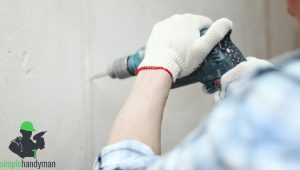 That’s why everyone, who wants to use cordless drill with variety of materials, have to make sure his tool is provided with high torque and 2-speed gearbox. This point is connected to torque and speed from the point above, because thanks to additional functions, we can choose the right speed and the right torque and make sure everything is adjusted for ourselves. Additional features like LED indicators that provides us information about battery condition or LED light to lighten the spot, where we are going to drill, is always a nice addition. However, we shouldn’t look for such minor functions and focus on torque settings with at least 10 positions as well as adjustable feature for bits and speed in general. A great thing to think about is of course keyless chuck, which will speed up the process of changing drills and bits. This particular aspect is not as important as previous ones, because additional equipment is very often very poorly prepared and they break after a month or two of use. That is why we always recommend looking for pure drills and purchase additional equipment like drill cases, bit sets, and other kits separately. 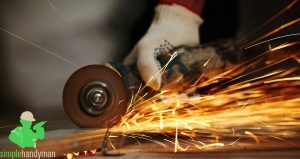 However, if you really want to look for additional equipment, then we recommend focusing on very important parts like batteries, cases for irregularly-shaped drills, and other things that can occur very difficult to find in the after-market. If we focus on the highest torque, then we will be able to partially forget about that aspect. Nevertheless, you should always pay attention to drilling capacities, since low and med-end drills are often lacking the energy. 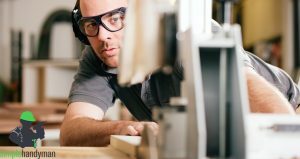 It’s good to have drilling capacity described in three types (materials): the drilling capacity in wood, in masonry, and in metal. Thanks to that we will be able to understand which drill is better when drilling in wood, which is better with masonry, and which with metal. This is a key aspect when it comes to durability. 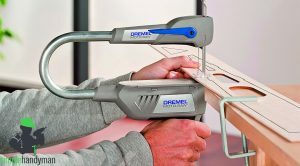 If we purchase drill with 36 mm in wood drilling capacity and we try to go through 50mm wood, then we might need to look for another drill, since the one we were using will simply break down. Finding the right drill under 100 pounds isn’t very difficult once you are aware where to look and how to look. Of course we recommend the listed productions, which fulfil most of the elements described above. However, we do not force you to choose any of them, since you can definitely get your own opinion and purchase the one drill that suits you the most.